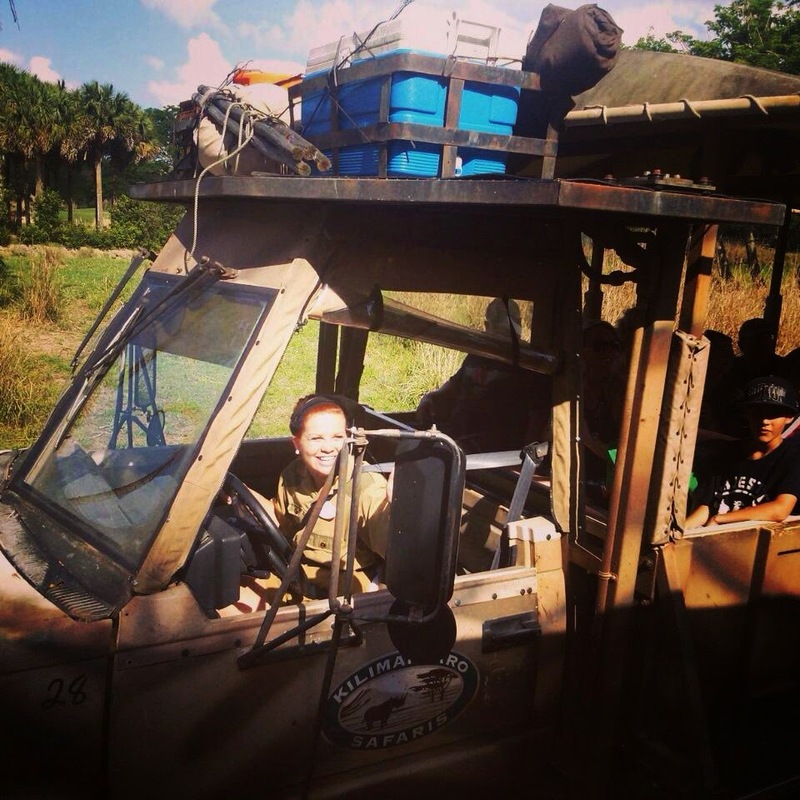 Sarah with her safari truck! Sarah was one of my roommates during my program. She had one of the coolest jobs as a safari driver in Animal Kingdom! It was so neat to hear some of the stories about the animals and the guests she would tell us after work some days, and after a while some of us started to memorize her safari spiel! ;) Here's what she had to say about her experience! I was Attractions, and was fortunately placed at a spieling attraction, more specifically Kilimanjaro Safaris at Disney's Animal Kingdom. A typical day included getting assigned a specific truck and then going through a checklist to get the truck ready to be taken to the ride path to be used for the day. The checklist included things like checking the tires, making sure the gauges and other electronics worked properly, and just generally assessing the vehicle for the day. After opening the truck and getting signed out by a manager, I would drive the truck a mile or so down to the ride path and then start taking guests! The days are broken up into (approximately) 2 hour sections, three or four of which are spent on a truck and the other spent on a "land" position like info guide (greeter) or departure (grouper). At the end of the day whatever truck I was on I would take off of the ride path and back to the Vehicle Maintenance parking lot where I would get it fueled and then shut it down for the evening! On any given day I would spiel to around 400 guests total. Or more. 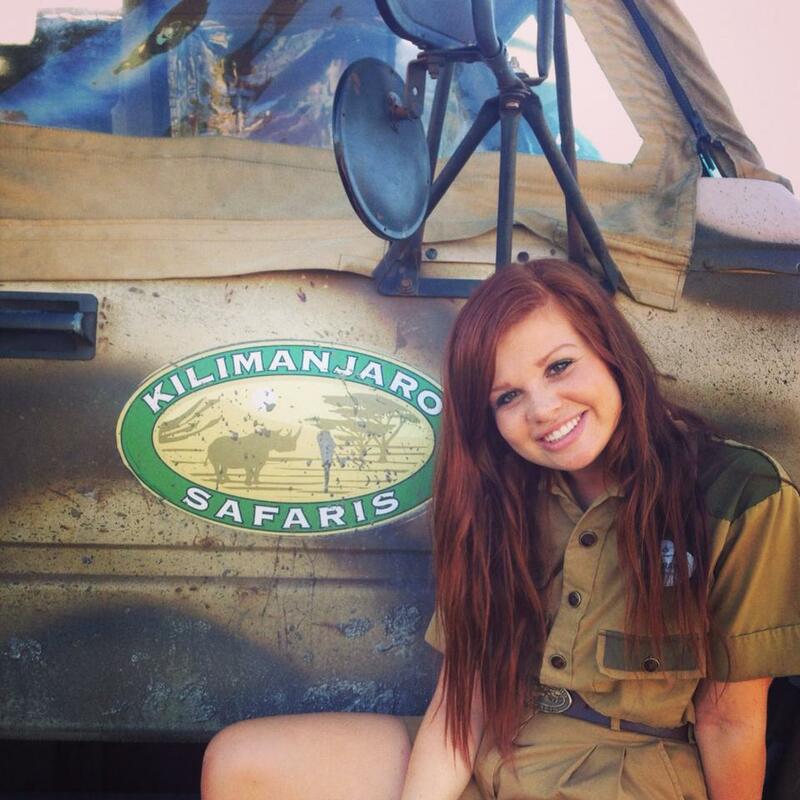 I originally wanted entertainment, but after a bombed dance audition, I couldn't have been more pleased with KSR (Kilimanjaro Safari Ride). Plus, entertainment success came later on... But thats a whole 'nother story. My favorite parts.. oh man, there are so many. The people I work with are incredible. KSR is a massive, beautiful attraction to run, with around 85+ cast members working each day, and about 200 employed in total. I love every single safari driver I work with, and their dedication, passion, humor and family-style love are things that are indescribable. Also, my guests. Getting to spend around 22 minutes alone with my 35-45 guests is a magical thing. I love being able to educate them while playfully bantering with and entertaining them simultaneously. Each exclamation of "oh wow!" or "I didn't know that!" that I heard on my truck makes me love my job even more. There is also nothing like applause after a safari ends or the numerous guests who would come up and tell me that my safari is the best they've ever been on, or come up to ask questions or share stories and facts with me. Not only did my guests learn a lot from me, I definitely learned a lot from them as well. Lastly, the animals. Even though I have grown accustomed to spending every day surrounded by lions, cheetahs, elephants, giraffes, hippos, rhinos, etc., these fabulous creatures still take my breath away. I can't believe I get paid to watch baby elephants splash around in a river, or to have white rhinos nuzzle my truck, giraffes linger within arms reach, and to hear lions roar. I won't ever forget each moment that I got to see the guest's reactions to these gorgeous, awe-inspiring animals. There are too many. One of my favorite Guest Service Fanatic cards came from a couple who happened to get on my truck during a slow point and I gave them a private safari. The lady had never been on the safari and, in fact, had just gotten released from a long stay in the hospital. She was amazed by each individual animal, but the lions were her favorite. When we pulled up to the kopje rock, I was so thankful to see the gorgeous male lion perched powerfully at the top of the rocks. Since I knew no other trucks were around, I sat and let her admire the lions for much longer than normally allowed. The tears on her face are something that will stay in my heart forever. Of course, small children provided many of the magical moments of my job. A lot of magical moments came, surprisingly, from working land positions. I always loved when tiny princesses would throw their arms around me or blow me kisses, and having guests ask if they could take pictures with me (I always say yes!). I just love interacting with guests.. I could go on forever. Also I got filmed to be on the Brazilian version of American Idol... that was interesting. Honestly, I think I was born knowing I wanted to do the DCP. I can't remember when I decided I wanted to do it, Disney is a fire that has always been in my blood. YOU WON'T NEED HALF THE STUFF YOU BRING. Also, two bedrooms in Patterson are wonderful, Vista Way actually isn't bad and I wish I would have lived there because of the social life, the party bus IS A BAD IDEA slash gross, don't date full timers even if they are a prince, DO NOT EVER CALL IN OR GET POINTS, yadda yadda yadda. Ooh this one is a bad one for me because my attraction is so different than others. The people you work with WILL BE YOUR CLOSEST FRIENDS (99.9 percent of the time) because you have similar schedules, you understand each other's work stories/problems, etc. If you are lucky enough to be placed at KSR then 1. congrats, 2. cross your fingers that Jimmy is your trainer cause he's the bomb, 3. always sit in the back of the VIP cast bus. Khaki rules! Pick the earliest arrival date possible, don't stress too much over which apartment complex you get, don't waste time oversleeping, enjoy every moment and spend every free moment with friends or at the parks, choose Advantage, DON'T get ANY points, pick spring because you get Star Wars Weekends, bring bed risers and a vacuum, take classes (particularly Entertainment PDS, its life changing). If you would like to see some of Sarah's safari tour, she makes a guest appearance in my Sara Squared Animal Kingdom Vlog here! If you have any questions for Sarah, you can ask through her twitter here! Or, if you don't have a twitter, feel free to leave any questions in the comments below and I can ask her for you! Will we be able to hear about Sarah's entertainment story?? I'm curious!! Well, her story is still in the process of being written! ;) She auditioned and went very far! She even had the opportunity to become possible close friends with Wendy Darling :) Still waiting to hear if they were meant to be best friends! This is crazy! I too am a DCP alumnus from Fall 2011. I was on the KSR attraction and I too had Jimmy as my trainer. Thank you so much for helping me to relive my program! Hey Sara, I just came across your blog and I wanted to tell you how amazing I think it is. I also did my WDWCP in Spring of '13. I was a Jungle Cruise Skipper and I miss it every single day. I look forward to hearing more from your blog to help me reminisce about all of the good times and help me stay informed with all things Disney that are happening now.